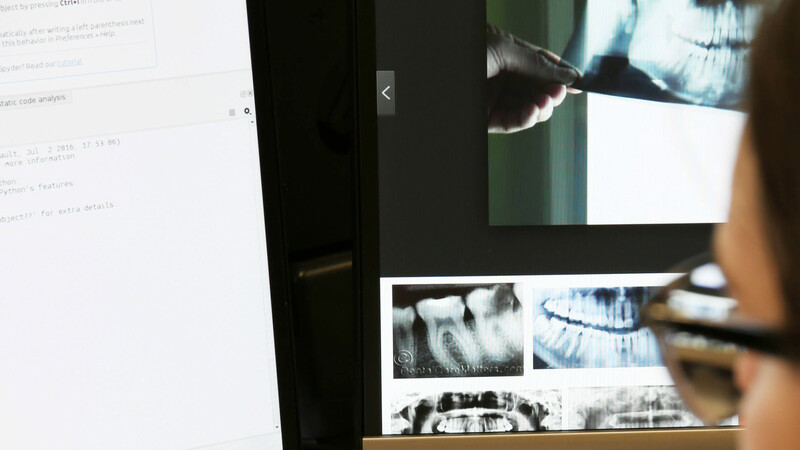 The main focus of the Biomedical Imaging Lab is the development of advanced image processing and analysis methodologies, particularly medical and biological images, with the aim of creating Computer-aided Diagnosis (CAD) tools to support medical decision making. The research activities at the Lab use several imaging modalities addressing different clinical departments including in Ophthalmology, Neurology, Radiology, Gynaecology, Obstetrics and Gastroenterology. SCREEN-DR ‑ The main goal of this research activity is the Screening of Diabetic Retinopathy (DR) in digital color photographs of the retina. It includes the automatic detection of image quality, and removal of low quality images, automatic detection of non-pathological cases, and automatic grading of DR for reflecting the disease severity. For this purpose, advanced image analysis and machine learning methodologies, including generic deep learning approaches, are being developed. RetinaCAD - The main goal of this research activity is the analysis of eye fundus images for early detection of prevalent eye pathologies, including diabetics and hypertension. This involves the detection and segmentation of main anatomical structures and their characterization in order to derive image-based biomarkers, namely the Central Retinal Arteriolar Equivalent (CRAE), the Central Retinal Venular Equivalent (CRVE) and the Arteriolar-to-Venular Ratio (AVR). The input data are also color retinal photographs. Advanced image analysis methodologies, including generic deep learning approaches are being used. ChoroidCAD ‑ The main goal of this research activity is to automatically measure the choroid thickness in Optical Coherence Tomography (OCT) images of the eye in order to correlate choroidal thickness changes with several eye diseases. Segmentation of lung anatomical structures, as lung lobes, airways and vasculature network, in order to have reference location structures and guide the detection and diagnosis tools. Early detection of lung pathologies in chest CT scans, with a reduced number of false positives is crucial to have immediate response of the health system, to allow an efficient treatment of the disease. Segmentation and characterization of lung lesions are relevant tools to establish the severity of the lesion. Finally, the above tools will contribute to have a CAD system, that can act as a second opinion system for lung cancer, to help, together with other clinical information, to predict the malignancy likelihood. Ultrasonography is a commonly used imaging modality for the examination of several pathologies due to its non-invasiveness, affordability and easiness of use. The Biomedical Imaging Lab is using ultrasound (US) imaging techniques in two lines of developments, to characterize vascular features in Carotid Cad, and applications in Ginaecology and Obstetrics, the Gyn-US. CarotidCAD ‑ The main goal of this line is the measurement of macro vascular characteristics, as calibers, layer thicknesses (as IMT - Intima-to-media Thickness), plaque burden and other markers in ultrasound images of the carotid. Gyn-US ‑Gyn-US aims to provide a quantitative and accurate CAD system for the diagnosis of ovarian and uterine pathologies, using B-mode and radio-frequency (RF), 2D and 3D US images. Currently Biomedical Imaging Lab has 17 researchers and 1 lab technicians. Interactive demo In this work, we propose a method that learns to synthesize eye fundus images directly from data. RetinaCAD is a computer-aided diagnosis system for fast, reliable and automatic measurement of several retinal biomarkers and several geometrical features associated with vessel bifurcations. 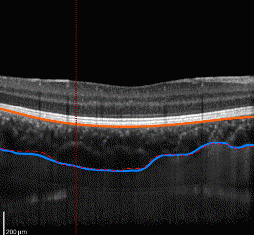 Calculating and mapping the choroidal thickness in the eye globe. Need additional information about the	Biomedical Imaging Laboratory?